Chronic lymphocytic leukemia (CLL) has multiple current frontline therapy options, including chemoimmunotherapy (CIT) and most recently, ibrutinib. Here, we review the most recent updates in the frontline treatment of CLL, including updates in CIT, updates in targeted therapies, and ongoing clinical trials. Ibrutinib was FDA-approved for the upfront treatment of CLL in 2016 after being studied in older patients and those with 17p deletions or TP53 mutations. The introduction of ibrutinib has dramatically changed the treatment paradigm of CLL. 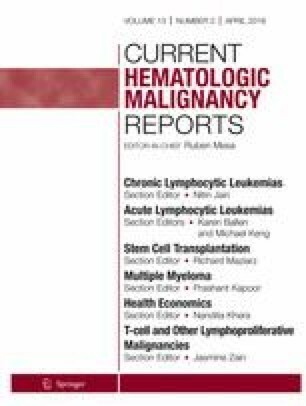 Recent updates in CIT include that immunoglobulin heavy chain variable (IGHV) gene mutation status is strongly predictive of response to CIT. Regarding targeted therapy, next-generation BTK and PI3K inhibitors are currently being studied in the upfront treatment of CLL, which may have less toxicity than their first-generation counterparts. Other novel targeted therapies are being studied in the frontline setting, most notably venetoclax including in combinations, with hopes to achieve chemotherapy-free, time-limited treatment options. Multiple key ongoing phase 3 clinical trials will be answering these important clinical questions. Craig S. Boddy declares no potential conflicts of interest. Shuo Ma reports personal fees from Pharmacyclics, Genetech, Abbvie, Gilead, and AstraZeneca and grants from Pharmacyclics, Abbvie, Gilead, AstraZeneca, Celgene, Xeme, and NCCN. SEER Cancer Stat Facts Chronic lymphocytic leukemia, MD http://seer.cancer.gov/statfacts/html/clyl.html. Accessed 27 Nov 2017. Flinn IW, O’Brien S, Kahl B, Patel M, Oki Y, Foss FF, et al. Duvelisib, a novel oral dual inhibitor of PI3K-delta,gamma, is clinically active in advanced hematologic malignancies. Blood. 2017:blood-2017-05-786566. https://doi.org/10.1182/blood-2017-05-786566. Chronic lymphocytic leukemia/small lymphocytic lymphoma. National Comprehensive Cancer Network (NCCN). https://www.nccn.org/professionals/physician_gls/pdf/cll.pdf. Accessed 1 Dec 2017. Sese L, Rivaud E, Bron C, Leblond V, Raffoux E, Longchampt E, et al. Unexpected pneumocystis jirovecii pneumonia in patients with untreated chronic lymphocytic leukemia. Leuk Lymphoma. 2017:1–4. https://doi.org/10.1080/10428194.2017.1357170.